The Dietary Guidelines for Americans offer a practical roadmap to help you make changes in your eating plan to improve your health. The first step is to focus on balancing calories with physical activity and consuming an overall healthy eating pattern. This will put you on the road to achieving or maintaining a healthy weight and reducing the risk of developing diet-related chronic diseases. The Dietary Guidelines recommend shifting eating patterns to eat more of some foods and nutrients and less of others. A healthy eating pattern will allow you to meet the recommendations while staying within your calorie needs. Whole grains: Increase whole grains by choosing whole grain breads and cereals, brown rice and whole wheat pasta. Make at least half your grain servings whole grains. 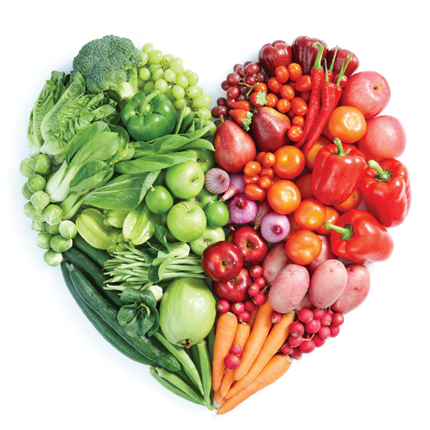 Vegetables: Eat a variety of vegetables, especially dark-green, red and orange vegetables plus beans and peas. Most adults need 2 ½ cups of vegetables per day. Fruits: Add fruit to meals and snacks—fresh, frozen or canned—to get about 2 cups each day. Low-fat or fat free milk, yogurt and cheese or fortified soy beverages: Include 3 cups per day for calcium, vitamin D, protein and potassium. Lactose-free milk is also an option. Vegetable oils such as canola, corn, olive, peanut and soybean: These are high in monounsaturated and polyunsaturated fats. Use in moderate amounts in place of solid fats. Seafood: Include a variety of seafood more often in place of some meat and poultry. More than one-third of all calories consumed by Americans are solid fats and added sugars. The recommendation for sodium remains the same—no more than 2,300 milligrams of sodium—for most people. However, a reduction to 1,500 milligrams per day is recommended for people over age 51, African-Americans and those with a history of high blood pressure, chronic kidney disease and diabetes. Prepare food using little salt or fewer high-sodium ingredients. For example, skip using salt in cooking pasta, rice, cereals and vegetables. Taste food before salting it. Lightly salt food only as needed, not as a habit. Eat fresh fruits and vegetables which are naturally low in sodium. Use herbs, spice rubs and fruit juices in cooking in place of salt. Eat fresh, lean meats, poulty, fish, dry and fresh beans and peas, unsalted nuts and eggs, all of which contain less sodium. For optimal health, most people should reduce their intake of solid fats and trans fat by replacing them with monounsaturated and polyunsaturated fats. Solid fats are found in fatty animal-based foods such as well-marbled meat, poultry skin, bacon, sausage, butter and whole milk products. Trans fat is found in foods made with vegetable oils that have been partially hydrogenated such as cookies, donuts, pastries and crackers. Most fats should be polyunsaturated or monounsaturated such as liquid vegetable oils like canola, olive, corn, peanut and soybean. Plant-based foods like nuts, seeds, olives and avocados also contain these healthy fats. Get a personalized eating plan at www.choosemyplate.gov. 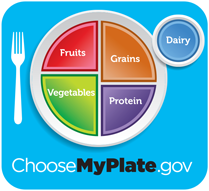 Your MyPlate Plan will give you the amounts of each food group you need daily. If you have special dietary needs, consult a registered dietitian for a customized plan. For a referral to a registration dietitian and for additional food and nutrition information visit www.eatright.org. ©2012 Academy of Nutrition and Dietetics. Reproduction of this tip sheet is permitted for educational purposes.